Perhaps the ear is the organ of storytelling, not the mouth. Amelia Bonea is a historian based at the University of Oxford and author of the book The News of Empire: Telegraphy, Journalism, and the Politics of Reporting in Colonial India, c.1830-1900 (New Delhi: Oxford University Press, 2016). Originally from Romania, she has lived and worked in Japan, Australia, Germany and the United Kingdom. When not engaged in academic research, she likes to read and translate children’s literature, most recently on StoryWeaver. I was flattered when I was asked to contribute a post to the StoryWeaver blog to mark International Mother Language Day, celebrated on February 21st. The day also marks the conclusion of StoryWeaver's Freedom to Read Campaign launched in September last year. I was obviously flattered by the proposal, but I couldn’t help thinking that I was the wrong person for the job, since most of my adult life has been a move away from my mother tongue. These days, when I use Romanian, it is mostly to speak with members of my family on the phone or in occasional email conversations with friends, many of whom are themselves migrants scattered around the world. ‘It’s conservator, not conservativ’, my mother offers timidly, reminding me again that at some point over the last seventeen years, some invisible mechanism caused me to start translating words and expressions from English into Romanian, rather than the other way around. The lady who translates my birth certificate into English is bolder still: ‘Got you!’, she grins with the confidence of the professional, ‘It’s to write in Romanian, not to write down.’ I mumble some feeble excuse about having lived abroad for too long and head for the door with my pride visibly hurt. I am no language purist, but I care about how I speak, especially when I have ‘important’ business to conduct in my hometown. I was born in communist Romania, during a time when bananas, chocolate and Coca Cola were prized commodities one learned to ration wisely so that they would last until uncle’s next visit home from university in Bucharest. I say Romania, but in fact I am more comfortable telling people that I am from Transylvania (not necessarily of Dracula and Bram Stoker fame, about which I came to know much later anyway, after I began my peregrinations abroad). As a child, I suspected that people from Bucharest were different: for one, they seemed to have easier access to foods we didn’t have and they kept referring to us as ‘provincials’; they also didn’t speak Romanian with a ‘Hungarian accent’, like we did. Not to be outdone, we reciprocated by feeling a tad superior to ‘those southerners’, among other things because of the dubious distinction of having once been part of the Austro-Hungarian Empire and thus exposed to the ‘civilizing’ influence of the West. In any case, I grew up with a clear understanding that the Romanian with which the nation-state so eagerly wanted us to identify was not the same across the length and breadth of the country: people in the eastern province of Moldova were known to speak with a ‘sweet’ accent, while those in the south seemed to be excessively fond of the perfect simple tense. The Romanian I spoke at home was not the same my grandmother spoke in her village, peppered as it was with regionalisms whose meaning I tried hard to remember. And although my grandmother, a wonderful storyteller whose memory seemed to know no bounds, often populated my childhood with characters from her eventful life—she had lived through WWII as a child—sadly I find that my own memory falters when I try to remember some of the words she was using. Romanian was also not the only language I grew up with. In fact, it might be fair to say that I have two mother tongues, at least as far as hearing is concerned. There are many ethnic Hungarians living in Transylvania—as there once used to be Germans, my own aunt included—and Hungarian is one of the languages which reminds me of home, despite the fact that I only have a superficial knowledge of it. When I was in primary school, I made a pact with a Hungarian friend that we would teach one another our languages. We moved away and lost contact before I managed to learn how to speak, but it was not unusual to have ‘bilingual’ conversations with neighbours or shop assistants: people would ask questions in Hungarian and I would respond in Romanian or the other way around. That’s how I learned that language wasn’t just speech, but a tool that could be used to play power games: one could use it to other people and by doing so, to stake a claim to a territory that did in fact belong to both interlocutors, not only to one or the other. I was reminded of these power games soon after the Revolution of December 1989, when our brief encounter with the Russian language as secondary school students was abruptly brought to an end by the new experiment with democracy and our teacher was made redundant. Russian fell out of favour practically overnight and we ended up studying French and English instead. All secondary school students were required to study two foreign languages at the time and we had no say as to which those two should be. What we knew was that studying English and French was ‘desirable’ as far as our future education and career prospects were concerned. When I finally had a say in the matter, I decided to learn Japanese and moved to Japan to study for a university degree in Asian Area Studies. Once there, I became interested in the colonial history of South Asia and began to study Hindi as well. The big difference from my previous linguistic encounters was that these languages did not use the Roman alphabet and so they completely unsettled my ideas about the world: from a relatively small pool of 26-31 letters, I found myself thrown into a seemingly endless ocean of characters which I wasn’t always sure how they differed from each other. It was easier with Hindi, but I still can’t remember the order of the Devanagari script, which makes searching a word in a dictionary a time-consuming affair (and yes, I have the same problem in Japanese, but I console myself with the knowledge that some of my Japanese colleagues have the same problem with the Roman alphabet). Much later, I also came to realize that these linguistics encounters have tweaked my brain in other, more subtle ways. I often find myself listening not only to what people say, but also to how they say it. I pay attention to their use of vocabulary and grammar. I read posters and billboards not necessarily because I am interested in the ads, but because I want to know what that character or expression means. Come to think of it, living abroad feels like a continuous language learning exercise. It gets tiring at times, but it is also exciting and enriching. Languages opened doors into worlds I didn’t know or knew little about. More than anything perhaps, learning languages has taught me to listen. Yoko Tawada, herself a straddler of worlds who lives in Germany and writes in German and Japanese, wrote in her book Where Europe Begins that, ‘Perhaps the ear is the organ of storytelling, not the mouth. Why else was the poison poured into the ear of Hamlet’s father rather than his mouth? To cut off a person from the world, you must first destroy not his mouth but his ear.’ I am reaching a stage in my life where I feel that I have come full circle and can now begin to translate some of the things I heard back into Romanian. And what better place to begin than with some of the best examples of storytelling out there, children’s books? 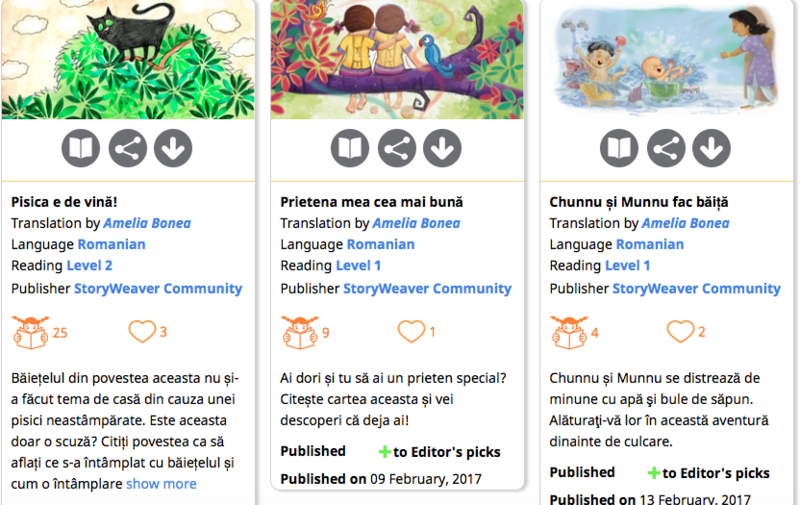 You can read Amelia's translations to Romanian on StoryWeaver here.